Many Avengers died at the end of 2018's Infinity War as villain Thanos snapped his fingers and wiped out half the Universe. Some fans were shocked to discover that Black Panther's Shuri, played by Letitia Wright, had died. Angela Bassett, who plays Shuri's mother Ramonda in Black Panther, said last year that both Ramonda and Shuri had survived. 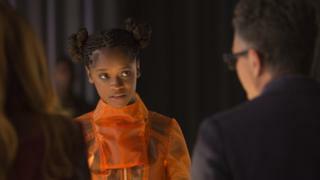 But a trailer for Endgame later suggested that this wasn't the case, as Shuri's photo was briefly shown among many pictures of missing characters. But some aren't convinced that the Princess of Wakanda really is dead. Marvel routinely uses trailers to mislead viewers about what to expect from their films, so fans can't be blamed for being wary about these latest publicity shots. Earlier this month, Endgame's directors, the Russo brothers, actually confirmed there was fake footage in the Endgame trailers, so there's a chance there could be some red herrings on the posters. The 32 new character posters for the film, which is released on 26 April, were posted across social media by the stars and the studio's official accounts. A colour poster featuring Tessa Thompson's Valkyrie confirmed that the character was alive and will return for Endgame, despite not appearing in Infinity War. Thor's adopted brother Loki (Tom Hiddleston), Thanos's adopted daughter Gamora (Zoe Saldana) and the android Vision (Paul Bettany) all died before Thanos's snap turned the rest of the fallen to dust. Disney has announced plans for several new Marvel TV series, including one based on Loki, on their new streaming service, Disney+. While the series could be a prequel, it could also mean the character's death in Infinity War might be reversible. With James Gunn now confirmed to direct a third Guardians of the Galaxy film, Saldana's Gamora could also be resurrected to play a key role in that film. As for Vision, well, he's an android, so perhaps there will be a way to reboot him. Tom Holland's Spider-Man was one of many heroes wiped out, but he will soon be seen in July's Spider-Man: Far From Home. Similarly, Marvel Studios president Kevin Feige has confirmed Benedict Cumberbatch's Doctor Strange will return for a sequel at "some point in the future". Chadwick Boseman's Black Panther is also set to recover from his untimely death in time for Black Panther 2, and it's likely his sister Shuri will too. There's also a third Guardians of the Galaxy film to come, and as the only living Guardians are currently Rocket and Nebula, it looks as though at least Drax, Groot, Mantis, Star-Lord and perhaps Gamora may return. Perhaps it's the fate of the characters in the colour posters we actually need to worry about.